My Cat Has an Upper Respiratory Infection and Cortisone Isn’t Helping! It isn't helping because it isn't appropriate. Find out how to properly treat URIs. I am a 1 year and 3 months old. I have the symptoms of a sickness that I got in the shelter while “getting my male parts taken care of” (as Daddy would say). I hate it! I can’t breathe and I sneeze all the time. I seem to want to sleep, and I don’t eat my normal plate of food. Playing with Daddy and Sissy makes me tired. I end up watching them play. Can you help? I already went to my regular vet and he gave me a cortizone shot and I haven’t felt good since. I think Juane Tom is telling you that he has calici and herpes for cats, and it is painful, and he is not the fearless hungry cat that we know. I was told to give the cortisone shot a couple of days to take effect, and then let it run its course for two weeks and watch for signs of panting and rapid breathing. He is hiding a lot, also. Juane Tom’s symptoms and background are utterly classic for an upper respiratory infection, or URI. URIs occur most frequently in younger cats whose immune systems have been weakened for some reason or other. Among the most common causes of weakened immune system function is stress, and I’m sure that getting neutered counts as stressful on a number of levels. Exposure to an environment with lots of other cats also predisposes cats to URIs, although it is not certain that Juane Tom “caught” the URI at the shelter where he was neutered — he may already have been infected, and the stress of surgery might have caused the symptoms to flare up. There are many potential causes of URIs in cats. The two most common sound like venereal diseases but aren’t: feline herpes virus and the feline Chlamydia bacteria. A third common cause is the feline calicivirus. In addition, dozens of other known viruses and bacteria (and probably hundreds that have yet to be discovered) may cause or play a role in the symptoms that Juane Tom is experiencing. PCR (short for polymerase chain reaction — or DNA evaluation) tests are available for cats suffering from URIs. Without these tests, it is not possible to say which pathogens are causing the symptoms. However, PCR testing is usually more academic than practical in nature. The cure for almost every type of URI is to support the cat’s immune system through nursing care (adequate diet and fluids, nebulization to break down respiratory secretions, rest, love, and antibiotics if appropriate for primary or secondary bacterial infections) until the cat’s immune system can kick the problem. I usually do not recommend cortisone for URIs. Cortisone weakens the immune system, so it has the potential to exacerbate URIs. However, that should not be taken as a criticism of your vet. It is always tempting for me to act as an armchair quarterback in these types of situations. I know in hindsight that the cortisone injection did not help. 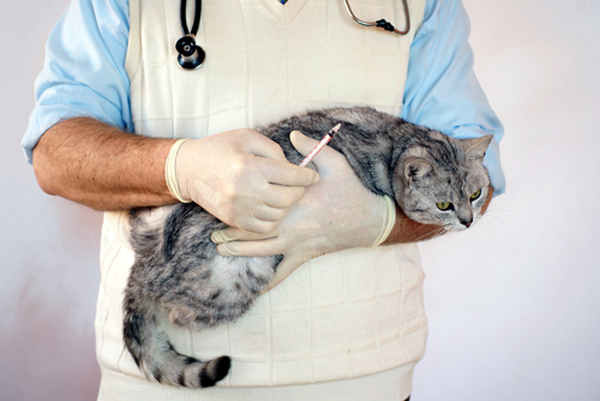 However, I do not know what symptoms your cat was experiencing at the time of the cortisone injection — cortisone can help with a lot of symptoms, and if your cat wasn’t suffering from typical URI signs at the time, then a cortisone shot might have seemed perfectly reasonable. I also wasn’t present in the room at the time, so I don’t know what other options might have been offered. What I do know is that Juane Tom is getting worse rather than better, and we can’t just sit by while this happens. He needs to be re-evaluated. Fluids and antibiotics may be warranted. It’s time to take him back in to the vet.